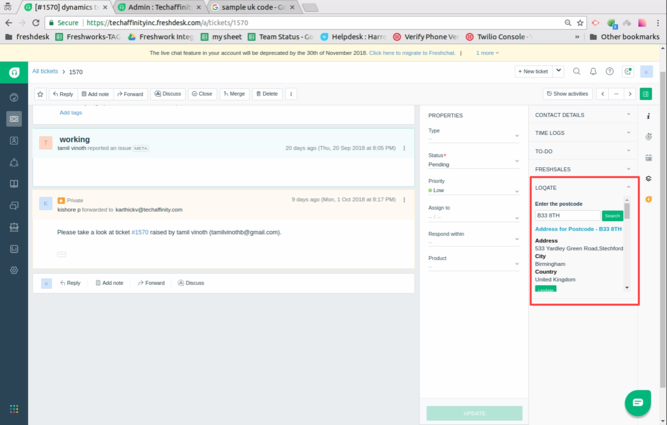 The contact export in Freshdesk now provides you with all the other emails of a contact, in addition to the primary email. Fancy forwarding a conversation using API? You'll love this update. You can also reply to a response received on a forwarded email and keep the conversation tight. At times, the emails that notify you about the failures in the contact/company import that you've recently attempted weren't sent or sent with a delay. We've fixed this and you'll receive them just in time to fix all your import woes! When the user logs in for the first time, the widget errors out and doesn't show up as expected. This has been fixed and you will no longer see the forbidden error. When the Interface API is used to disable a single line text field, the text stored previously seem to be ill-formatted. Fixed now. Skype for Freshdesk: Integrate your Skype account with Freshdesk and have all your conversations in one place. The forward feature looks cool, and I'd like to try to implement it. Unfortunately, I could not find any documentation for the forward API, do you know where it is available? @Tom, Here's a sample request that can help you get started with the Forward API.